Patchy Work of Mini Grey: Jumping Crocs! Hi, I'm Helen, I used to blog four times a week? Now it's like four times a month. Am I loosing that blogging buzz? I think about it every now and again and wonder why this is. A few reasons. As part of my current job I update and maintan the school website, so that may take the edge of my blogging bug. Other than that, just a combination of being busy, work, girls after school stuff, a bit of excersice and then sleep and the day is over to start all again the next day. And also holidays for us aren't staying at home anymore, well not at least for the whole holiday. 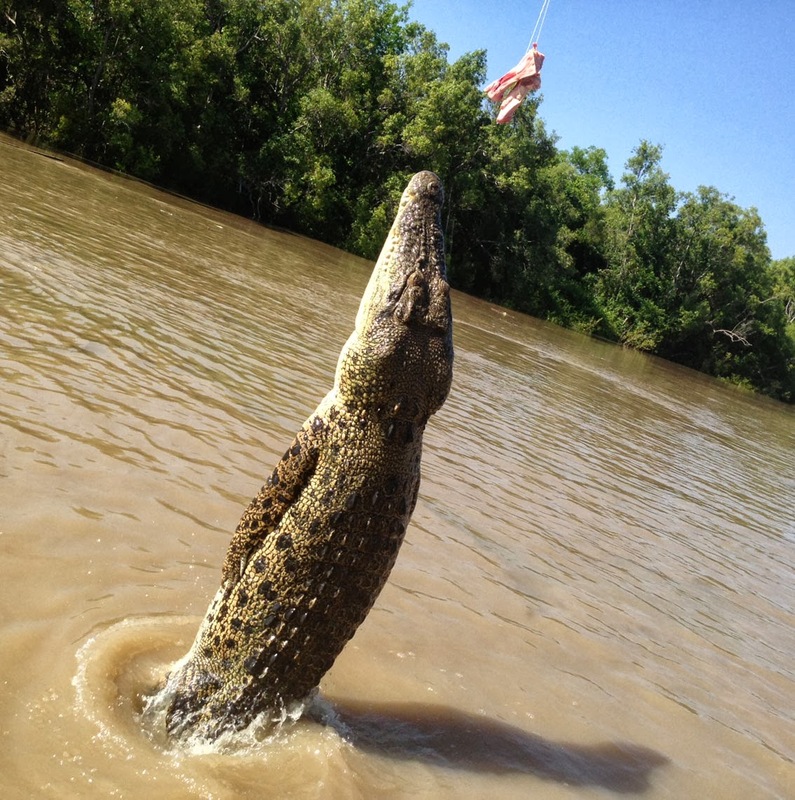 We have just had two weeks off for the end of term three and look what we saw, jumping saltwater crocs!!! We spent a week in Darwin, relaxing by the pool with friends, shopping, a movie, eating out, more shopping, visiting markets, more eating out and more relaxing by the pool! It was delightful. We did spend one day doing something touristy. I have wanted to go on a Jumping Croc tour for ages, booked one at last with this company here. It was so cool!! 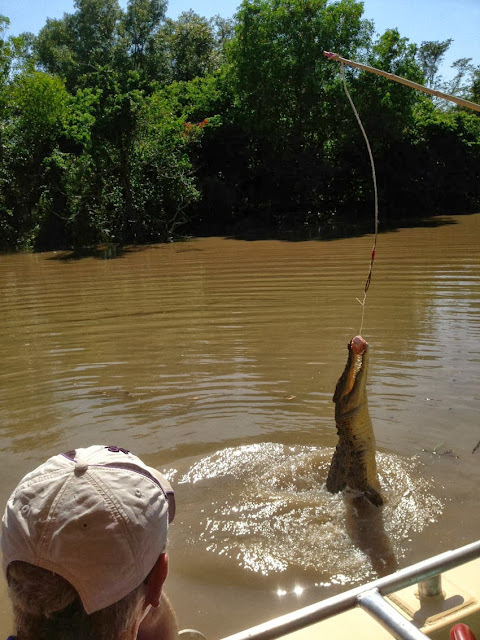 It was just amazing, as soon as we had travelled 500 metres down the river, two crocs just swam straight up to the boat, just waiting for the food. It was actually pig's heads that were being dangled on the end of the rope for them to eat. They are so quiet and then BAM, they flick their tail and propel themselves up and snap that meat and then splash down and have dissappeared into the brown water. If you fell in you'd be gone. And after all that excitment we came home and I had three days to sew before we went back to school. 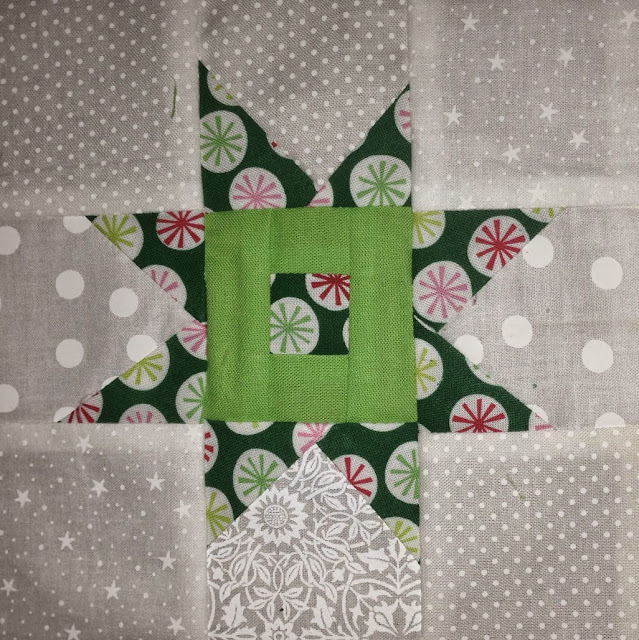 I have decided to sew some table runners for Christmas pressies doing wonky stars. Using up scraps of white and Kona Sour Apple I think and some Christmas print recieved as a Christmas pressie from last year. I have two months to make about four. Doable? Of course!! Greeeaaaat. Just great. 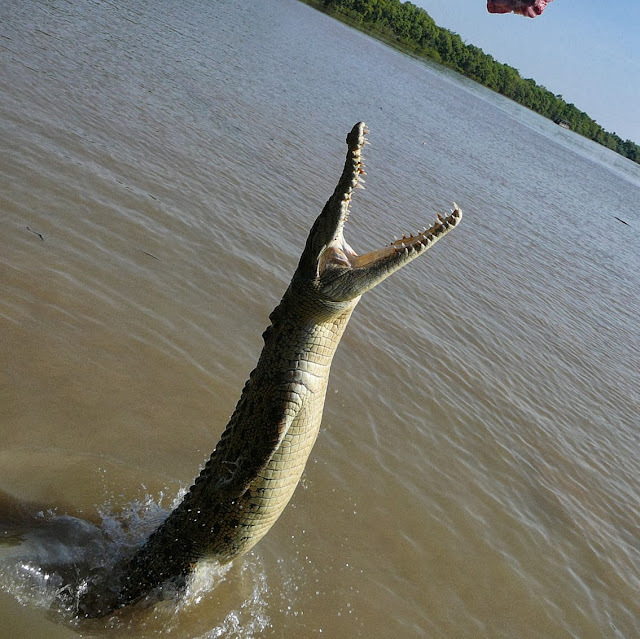 Jumping crocodiles. It's truly a wonder there are any living human beings on your continent. Awesome photos. I found when I worked in a job that involved a lot of online time that I blogged a lot less for my personal blog. The table runners are going to look fabulous. Love the wonky stars.